Home » Moving Painting » How Are They Used? Framed moving digital paintings range in size from six inches to sixty inches for single screen installations. Forty plus sized screens are arresting from a dozen feet awayand sixty inch screens can draw a viewer into a large room, such as a lobby or penthouse.Multiple screen installations can occupy an entire wall, or an entire hallway—bounded only by the designers imagination. Clients find that multiple screens can tie aspace together with an unforgettable room-sized multimedia experience with all the subtlety and grace of traditional canvassed art. Framed applications excel in high profile areas where first impressions matter. Projection works well in a space with exposed walls and low light. Careful integration with surrounding details transforms a space into a room-sized moving sculpture. 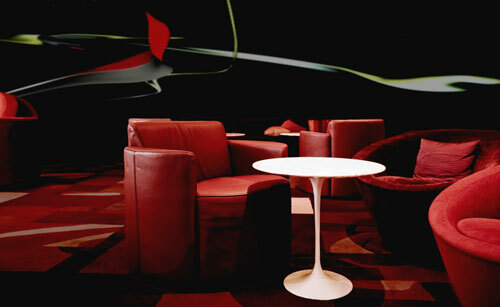 Multiple projections can wrap an entire space in a constantly evolving environment of shapeand color. Spa and club applications are particularly successful. 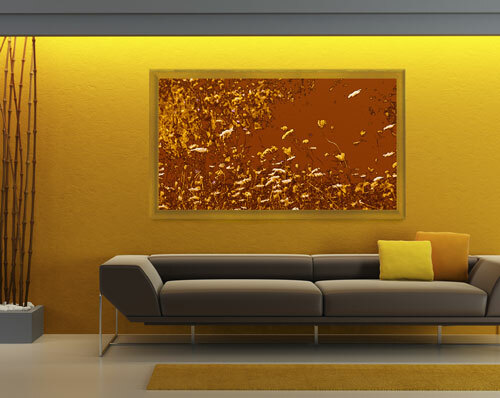 Licensed paintings are rendered on preexisting screens or video equipment such aspenthouse A/V theatres, bar televisions, guest room flat screens, fitness center displays,or lobby digital signage. We work with the building’s operations staff to determinethe most appropriate method of installation and integration to existing A/V systems. Clients license the use of moving digital paintings for existing screens that cry out for fine art that fits with their project vision.